Why Are Spaces in Science Fiction Not Wheelchair-Accessible? Space, as we all know, is the final frontier. It’s the star-spangled playground in which our imaginations run amok, and the setting for stories that made us fall in love with sci-fi. Some of us spent hours pretending we were the Doctor’s companions, helping him find Gallifrey from the TARDIS. Some of us imagined the Millennium Falcon jumping to hyperspace when we shouted, “Punch it, Chewie!” Some of us swore we could hear the communicator beeping when we asked our favorite Federation starship to beam us aboard. The characters that roam space have built homes in our hearts and allowed those of us who are trapped in Earth’s gravity-well to fulfill some of our wildest fantasies. Space remains a vast, untamed place, penned in only by the limits of our own imaginations. So why the hell are there so many staircases in space? Then I started using a wheelchair. Suddenly, stairs became a barrier that prevented me from getting from here to there. One step was often enough to stop me in my tracks. It turns out that when you start using a wheelchair, you quickly realize that there are a lot of staircases and steps in our world—and a lot of broken (or nonexistent) elevators and ramps. Doctor Who’s first episode aired in 1964, predating the beginning of the Star Trek franchise by two years. Unfortunately, 50 years worth of Federation starship manifestations also means half a century of inaccessibility. The original USS Enterprise bridge has enough steps you could take the equivalent of an aerobics class just trying to get from the turbolift to the Captain’s chair. The same level of inaccessibility goes for both the USS Voyager and USS Discovery, and if you’re a wheelchair user, you better not try to grab an after-shift bottle of bloodwine at Quark’s Bar unless you plan on dragging yourself up several steps to get there. In fact, the bridge from The Next Generation’s Enterprise is the only one that’s fully accessible with gentle, sloping ramps. Of course, some nondisabled humans argue that if a series originally started filming in the 1960s, it’s inevitable that inaccessibility would carry on in today’s updated versions! (Among other counterarguments, I’d like to note that Star Trek is supposed to be a utopian paradise. “All the problems of mankind have been solved,” Gene Roddenberry told Michael Pillar, a screenwriter on Star Trek: Insurrection. “Earth is a paradise.” Contrary to ableist opinion, a utopia is not a world where disability is a problem that’s been solved; rather, it’s an inevitable expression of genetic variance, and disabled humans are not just welcomed but fully included.) While the world may have been more inaccessible in the 1960s, the Disability Rights movement began alongside the birth of the Civil Rights movement. Regardless, tons of present-day sci-fi is as guilty of inaccessibility as the ghosts of Jedi Masters’ past. It’s a tough porg to swallow, but even with more than a decade on Star Trek and Doctor Who, the original Star Wars trilogy leaves lots to be desired in terms of accessibility. I’ve got a slim chance of successfully wheeling into Owen and Beru’s moisture farm for a glass of blue milk to cool down: it’s staircases all the way down. The Mos Eisley cantina appears as interested in serving disabled patrons as it is in serving droids, based on the steps I’d have to take to get inside that wretched hive of scum and villainy. Even if we ignore the prequel trilogy the way the Force intended and focus solely on The Force Awakens—a film that came out barely three years ago—inaccessibility reigns in Episodes VII and VIII as supremely as Snoke himself. There seems to be no ramp hidden behind the colored flags that flutter over the staircase that leads into Maz Kanata’s castle. (To be fair, maybe the ramp is around the back, the way they usually are in real life.) BB-8 manages to head down some stairs inside, but we don’t see him come back up. The spherical droid is an adorable Swiss Army Knife whose body panels have already revealed hidden tools, like a firey thumbs-up and tethers that can attach to the walls. 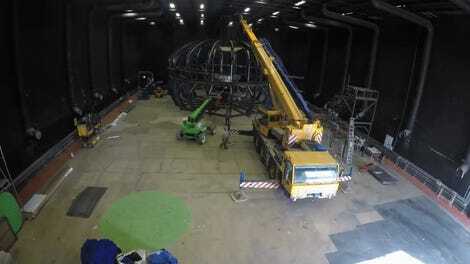 Perhaps one of his panels also has the secret to climbing up stairs hidden inside. The Last Jedi has an even more recent release date, but even with all the First Order money in the galaxy—and therefore no way to claim that accessibility was too expensive to achieve—the Casino on Canto Bight is one wide, luxurious staircase after another. If I kept going, the list of exclusionary staircases in the sci-fi we hold near and dear could run longer than a staircase up to a treehouse on Kashyyyk—and no, I’m sorry to say that neither The Expanse nor Firefly escape that list—but it’s still easy to miss what all those steps actually mean, especially when you’re not viewing the world through the experience of disability. When you don’t need wheels to get around, the world is literally built for you. Until I received my degenerative disease diagnosis at 26, I never once wondered why I so rarely saw disabled humans out and about. It never occurred to me that our world forcibly ostracizes those who require accessibility devices by way of architecture. Our real world is a remarkably inaccessible place. I haven’t made it to a movie theater on opening night in years without running into a plethora of issues, from broken captioning devices to nondisabled people sitting in seats for wheelchair users and their companions, to theaters that are physically inaccessible to me because of those dang steps and staircases. Although the U.S. passed the Americans with Disabilities Act (ADA) in 1990, legislation intended to offer accessibility to disabled people in public places, many of its protections are ignored by business owners who see accessibility as not a boon but a burden. The world is inaccessible even outside of movie theaters: a lawsuit was filed last year against the New York Subway System because it’s 80 percent inaccessible to disabled people. Less than 20 percent of polling places were fully accessible to disabled people during the 2016 election. Only 17 percent of NYC elementary schools were fully compliant with the ADA in 2015. HR 620, a bill intended to strip the ADA of what teeth it does have and place the onus of compliance on disabled patrons instead of business owners, passed in the House earlier this year. Like the list of sci-fi staircases, the stories about real-world inaccessibility go on in perpetuity. Given that, is it really surprising that our fantasy worlds are reflective of the inaccessibility that occurs in our real-world society? 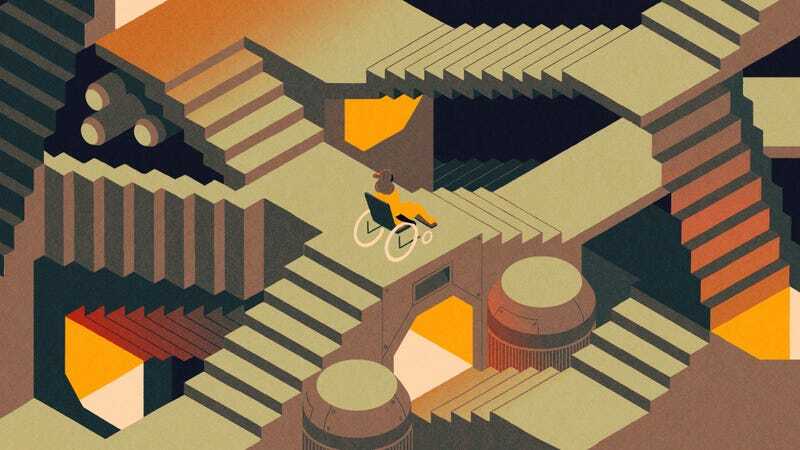 The hundreds of thousands of fictional worlds built with all those staircases are a silent but persistent signal that disabled representation isn’t just a low priority, it rarely exists at all. While disabled people make up 20 percent of the population, we are featured in less than 2 percent of screen time and still images we see in the media. More than 95 percent of that minuscule 2 percent of disabled roles are played by nondisabled actors. Chirrut Imwe, a blind monk in Rogue One, was played by Donnie Yen, a fully-sighted actor. DJ, the stuttering thief in The Last Jedi, was played by Benicio Del Toro, an actor sans speech impediment. I love Geordi La Forge, but Levar Burton has exactly as many sight issues as Yen does. While Doctor Who should be applauded for two episodes featuring deaf actors, Sophie Stone and Tim Barlow, and one featuring Rachel Denning, who has dwarfism, it’s hard to be excited when you realize three episodes out of a whopping 840 in total works out to just 0.3 percent worth of representation. When disability is actually, finally addressed in the plot, it is often treated as a symbol of villainy. Anakin’s scar, inflicted in the extended universe between Attack of the Clones and Revenge of the Sith, is symbolic of his move towards the Dark Side. His transformation is complete with multiple amputations and his literal incineration at the end of Episode III—prime examples of disability stands for villainy as a wink-nudge to the audience. Disability is all-too-frequently used as something terrible that must be fixed. “The Menagerie,” a Star Trek original series episode centered on fixing Captain Pike’s disfigurement, won a Hugo award; “Ethics,” A Star Trek: The Next Generation episode found Lieutenant Worf paralyzed. Because his Klingon upbringing viewed life as over at the moment of injury, he risks an untested surgical procedure instead of embracing a disabled life. Even Capaldi’s version of the Doctor goes blind for two episodes before being conveniently cured. I can’t help but wonder how much the blatant issue of real-world inaccessibility leads to the scarcity of disabled writers, actors, directors, and producers that’s illustrated in inaccessible spaceships and stories that severely lack in disability diversity. Considering that the unemployment rate for disabled people was more than twice that of nondisabled people, a statistic that’s held steady for years, it’s hard to not see a connection. Trying to find solid information that upholds the probability of this connection is a more difficult task. Without disabled people pushing to make sure we’re included, nondisabled creators have minimal reason to notice our exclusion and even less reason to focus on categorizing the systemic reasons for our blackballing. In the search for evidence to prove my thesis, I was excited to find that the Writers Guild of America (WGA) had a Writers With Disabilities Committee as part of their Inclusion and Equity Department. I was able to chat with David Radcliff, a member of the Committee and a staff writer on an upcoming major network drama. Radcliff noted that unemployment levels for disabled people remain steadily high, even when the unemployment rate for nondisabled workers ebb and flow. Inaccessibility surely must be a contributing factor to the fact that disabled people are unemployed at double the rate of nondisabled people. “It’s the job of the writer [to include disabled roles], but also the casting director,” Radcliff continued. “The offices of casting directors need to be uniformly accessible in order to make sure that we’re seeing a variety of actors for different roles... It’s rare where we would see someone like [us] in the background [scene] of a party or applying for a job or going to the beach or whatever.” If disabled actors can’t even physically show up to casting calls to audition, is it any wonder that spaceships end up inaccessible as well? Radcliff is quick to note that the exclusion of disabled people is a systemic issue, and not simply a problem that can be blamed on writers or casting offices or even directors. “I think that [another reason] is that most diversity initiatives within networks don’t make a conscious effort to include disability,” Radcliff pointed out. “There are a lot of wonderful organizations [within networks that are] specifically attuned to increasing opportunities for people who are, say, Asian-American… but I don’t know of any [major network diversity initiative] organizations that exist for creative folks who are identified as having a disability.” Including disabled people at all levels of creating the stories we love is the way we end up with a fully accessible TARDIS. “A family of diverse storytellers trying to tell great stories is ultimately the end goal,” Radcliff concluded before applauding the greater degree of freedom disabled artists have to create their own content, thanks in part to the evolution of the internet and streaming platforms. He encourages disabled people who feel excluded to start shaping their own media while continuing to push major networks towards better inclusivity, representation, and accessibility for employees both on-screen and off. After chatting with Radcliff about the physical inaccessibility of so much of Hollywood and the exclusion of disabled people as a result, I reached out to Cat Rambo, President of Science Fiction & Fantasy Writers of America (SFWA), an organization founded in 1965 to promote, advance, and support science fiction and fantasy writing in the US and beyond. While the SFWA doesn’t yet have tracking on how many of their members identify as disabled, the board is talking about adding questions related to disability on their membership questionnaire to help disabled writers identify themselves as such, should they so choose. SFWA also has an accessibility checklist for SFWA conventions and other gatherings to help ensure full accessibility compliance. The checklist has existed for more than a decade and was created by Lee Martindale, a writer, anthology editor, Lifetime Active member of SFWA, and a paraplegic who was a member of the SFWA Board of Directors when the checklist was created. That accessibility checklist is integral to the SFWA, explained Rambo. “Conventions already demand a huge level of energy, and [without the checklist], we end up at conventions where we aren’t hearing from [disabled] voices, where other writers aren’t considering disability in their fiction. [Disabled people] become invisible to them.” Conventions are often places where connections are made and major award ceremonies for the industry are held. When they’re physically inaccessible, disabled people are removed from networking and storytelling in a very real way. The SFWA is a prime example of how the physical inclusion of disabled bodies creates the opportunity for storytelling that includes disability, too. Sci-fi exists, in part, to show us the universe as it could be—to inspire both imagination and spirit as we gaze up at the stars and try to tame an incomprehensible galaxy with our stories. In a universe this big, sci-fi could show us a reality where we have evolved beyond neglecting or outright ignoring a significant portion of our population. Our space dreams are broad enough for anything, including stories in which disability is neither a signpost for villainy nor a cure-all plot point. Space should remain the final frontier, not our human biases. Ace Ratcliff lives and works in Oakland, CA with her fiancé and their pack of wild beasts. Her hypermobile Ehlers-Danlos Syndrome makes for a rebellious meatcage. She tweets @mortuaryreport and can be reached here. Disabled Fans and Creators Are Kept Out of Too Many Conventions. Now They&apos;re Not Alone.